Just because a rainy day prevents outdoor physical activity doesn't mean it has to drain all of the fun out of physical education. Many indoor gym games that children can play help improve their coordination, speed, agility and ability to follow rules just as well as any outside game or activity. 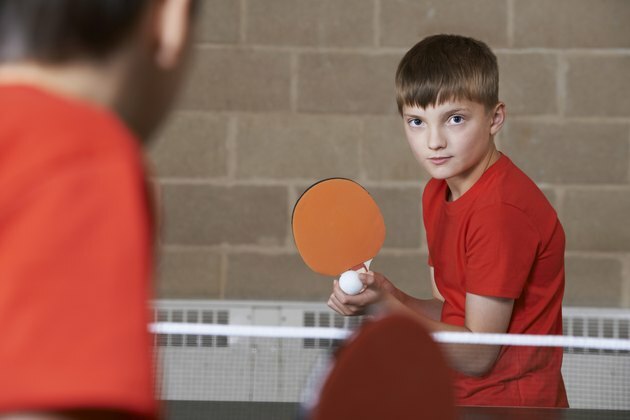 Certain games traditionally played outside can be modified and played in a gym rather than on the grass or blacktop, and introducing new games can encourage students to participate. Set up a game of dodge ball inside the gym to help students practice their hand-eye coordination as they throw and catch the ball, as well as their speed and agility as they try to dodge it. Use a bouncy rubber ball as the dodge ball. Divide the students into two teams. Have each team wear different color PE bibs to distinguish who is on each side. Flip a coin to see which team starts with the ball. Have a student from the starting team throw the ball at an opposing team member's legs; the ball should not be thrown hard and it should only be aimed at the lower body. If the student is hit in the legs, he is out and must leave the game until the next round. If he catches the ball before it hits the ground, the student who threw it is out. If no one is hit or no one catches the ball, the first person to grab the ball has the chance throw it at an opposing team member. Allow students to run around the designated area in the gym to avoid being hit. The first team to eliminate all of the other team's players wins. Modify red light, green light for indoor play to help students improve their speed and endurance as they try to get as far as they can on a green light, as well as their ability to follow directions. Select one student to play the traffic light. Have the students line up on one side of the gym and have the traffic light stand on the opposite side of the gym with her back to the other students. Instruct the traffic light to randomly call out red light and green light. Have the rest of the students start running toward the traffic light when green light is called and stop when red light is called. If anyone moves after red light is called, send them back to the starting line. The student who makes it to the traffic light first gets the be the traffic light next. Help students enhance their speed and agility as they try to free their teammates with an indoor game of prisoner of war. Select two teams. Have each team wear different color PE bibs to distinguish sides. Select a member from each team to be the first prisoner of war in the opposing team's jail. Set up two cones at each end of the gym to designate the jail area for each team. Have each team start on opposite sides of the gym in front of their jail. Instruct both teams to run toward the other team's jail in an attempt to free their fellow team members. Anyone tagged must go to jail. Rescuers who make it to the other team's jail untagged are safe as long as they stay there. They can only free one prisoner at a time and must choose the best time to attempt an escape with their team member who is prisoner. The first team to free all of its prisoners wins. Explain the rules and designate the play area in the gym before you start each game. Instruct all students to follow safety precautions when playing indoors. Kid Activities: Gym Games for School-Age Kids!